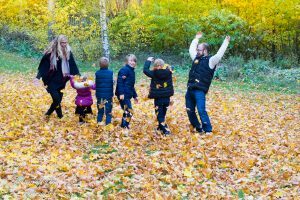 On a very crisp, clear and cold Autumn morning I had the pleasure of photographing my very first family photo session for my new company! A great, energetic family with mamma, pappa and four siblings. The children had a wonderful time climbing trees and running around and playing in the incredibly vibrant Autumn leaves. There were literally seas of leaves to roll around in and throw up in the air. A childs dream! Mamma and Pappa had a few special moments together with the comment that they hadn’t had photos like this since their wedding day! They chatted and laughed together and their deep love for each other was clearly evident in their photos. It was a perfect Autumn morning in beautiful Sweden! The family drove away with a car full of smiling children! I was left with a feeling of great uplifting, encouragement and pure joy. What a wonderful career I have been blessed with!